City trips are more popular than ever with consumers in the Netherlands and Belgium. Research has shown that the Dutch make 3,1 million city trips per year! 89% of these were booked in advance and 81% was booked online (NBTC Nipo). The Dutch go on holiday more often and this growth is mainly realized by a 5% increase of city trips abroad. A clear trend is the increase in Dutch travel to the rest of Europe (+4%) as well as in Dutch intercontinental travel (+21%). NBTC-NIPO predicts that there will be even more growth on Dutch traveling intercontinental and to the rest of Europe. This proves that investing in our company is a good idea. On our platform (website and app) we inspire our visitors with high quality information on what they can do during a city break and where they should go next. And that for over 15 years now! Unique is our online pdf city guide concept: visitors can compose their own city guide by selecting the items they like. Via inspiring content integrations, advertisements, banners and social media campaigns we reach a wide group of tourists. Consumer approval is borne out by the 245,000 unique visitors that visit the website every month, the 83,500 subscribers of the newsletter, the 45,000 users of the app and the 8,500 fans we have on social media (measured July 2018). The majority of our visitors (80%) is from the Netherlands and the rest (20%) from Belgium and other countries. CityZapper is the ideal website to bring your product and services to the specific attention of this adventurous group of frequent travelers with a mid-level or higher income. Our target group is between the 25 and 60 years old and has special interest in: travel (cities), lifestyle, art, culture, shopping and culinary aspects. The key question is: why are you not yet represented on CityZapper? When over 30 international tourist boards trust their promotion and marketing budgets to us, why shouldn't you? Please, find below a few of the many possibilities we offer. We are always open to suggestions or creative ideas and we would be more than happy to work out other promotion opportunities or ideas with you. Our Destination Promotion campaign is ideal to create exposure for your city (big or small!) during 12 months. Five publications in our inspirational blog. Item in our newsletter, send to 83,500 subscribers. Active promotion of your city via our social media. The opportunity to compose your own campaign by selecting the commercial add-ons that fit your strategy (e.g. advertisement blocks to promote your travel packages, banners or hotel advertorials). See Osnabrück as an example. Our premium package - the City of the Month Campaign - will promote your city or destination a full month with sitewide visibility, which creates maximum exposure. Further rollout and follow-up will be during another 11 months. Your city guide will be free of charge in the CityZapper app during promotion month. Newsletter special only about your city, send to 83,500 subscribers. Creation and publication of a billboard banner and large rectangle banner. Eight block advertisements on your city’s landing page (12 months) and homepage (promotion month) to use with offers from local partners. The opportunity to upgrade your campaign with a floor ad, interscroller, free app or other possibilities. See Kassel as an example. With Christmas and New Year CityZapper inspires visitors for city breaks to magical winter cities. We even have a special app for this period of the year! The campaign runs from November till February. 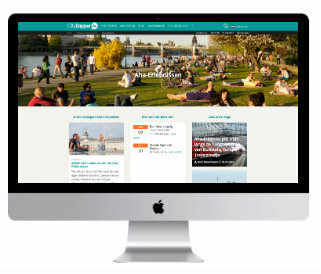 CityZapper is every year the only Dutch exhibitor presenting a city portal at the Vakantiebeurs (Dutch Tourism Expo), the biggest travel expo in the Benelux with more than 120,000 visitors. The Dutch Tourism Expo takes place from 9th till 14th January 2018 in Utrecht. You can have a desk in our booth to present your destination to the Dutch tourist. You can decide whether you would like to be at the fair the whole week, or just the B2B days, as we can take care of the consumer days. This will safe you a lot of time. All production costs and the creation of the banner are included in the price. Please note that we have limited availability for this attractive offer. Put the best sites of your city in the spotlight with a newsletter special, send to our 83,500 subscribers. This newsletter will only have information about your destination so our subscribers will totally be inspired with your destination. Editorial attractive and commercially interesting, those are the sponsored stories of CityZapper. We make sure the message meets your wishes, but still fits to our platform. An effective way to communicate your message in a natural way to a dedicated target group! With a social media contest we can highlight your destination via a give away. A contest for our fans is a perfect way to increase awareness and reach the target group! In the past, we organized a lot of successful price contests. Please, find an example for Norway Home of Skiing here. The character of the price contest is in consultation. Integration of relevant tags, mentions, links and/or logo's. Promotion via social media, homepage of the website, app (push notification and slider on the home) and the newsletter. The cooperation with CityZapper is excellent. The team is friendly, fast and very efficient. The site is well designed and visitors are informed about everything. I enjoy working with CityZapper! 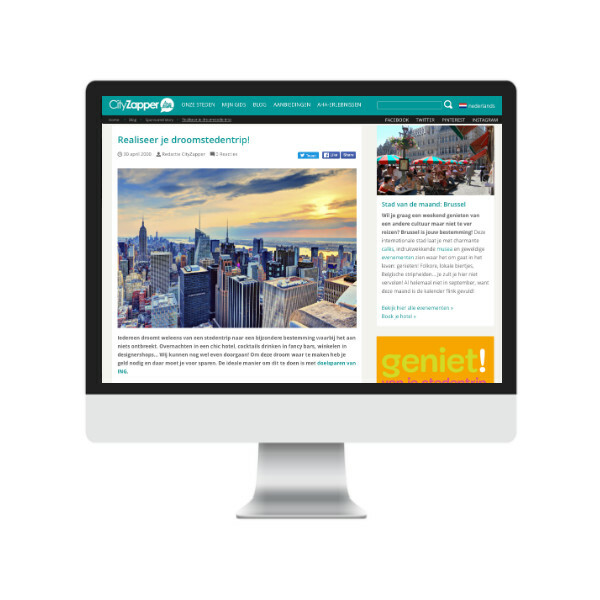 Dutch journalists and bloggers deployed by CityZapper make qualitative and attractive content. Consultations are always flexible and professional. That makes CityZapper an attractive partner for the promotion of our cities like Liege, Namur and Brussels. 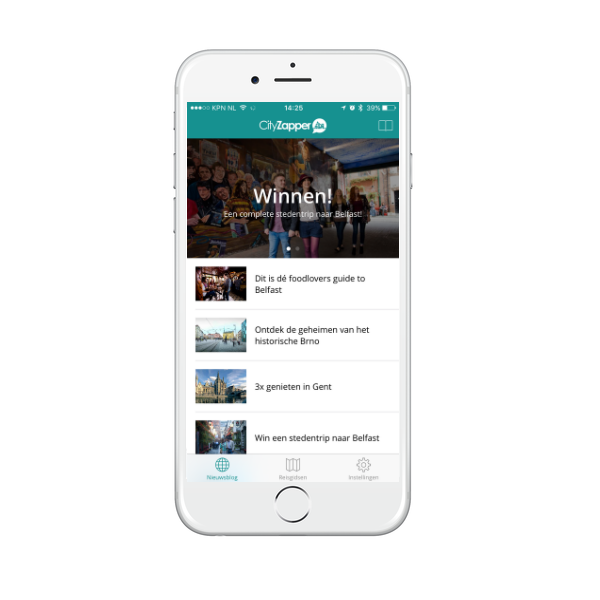 We are now working in the second year together with CityZapper for the marketing in the Dutch market, which is of particular importance to us. With City Zapper, we found a reliable partner due to their very competent support, sharing knowledge and the vision for a modern city tourism. We are looking forward to a continued good cooperation. 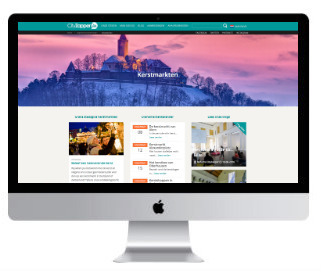 Through the cooperation with CityZapper, we can present Frankfurt as a travel destination to a young and travel-enthusiastic audience. The work with the staff of CityZapper has always been very professional and a great experience to work with people passionate about what they are doing. There are always new and creative ideas and marketing opportunities to promote a city in its best way. CityZapper consists of a team of Media professionals that add value by thinking along with their customer in getting the job done. Working with CityZapper is a true pleasure! CityZapper has proven to be a leader in providing innovative and creative marketing strategies in the Dutch and German markets for Edmonton International Airport and our partners. Christian and his team have delivered excellent marketing and PR services with great enthusiasm to help drive sales and results for Edmonton and Jasper. It has been a pleasure to collaborate with them. As a new destination company to The Netherlands in 2015 – we decided to partner all our marketing efforts for our Ski Portfolio in Norway with CityZapper. One year later and we have again re-signed a deal for Winter 16/17 – due to the most fantastic, energetic and visible campaign we could have hoped for last Winter. Most importantly, our commercial turnover increased significantly and also our brand awareness to both the Dutch consumers and Operators. We are simply delighted to have CityZapper as our Marketing company in The Netherlands.